Experience the ornate world of Islamic design at the Sheikh Zayed Grand Mosque. Heading to Europe and want to stop halfway, rather than do the whole long-haul in a one-r? We think that’s a great idea – and here are eight irresistible reasons to make Abu Dhabi your next stop-over. If Abu Dhabi is on your travel bucket list but you don’t have a lot of time up your sleeve, then a stop-over is the perfect option. Here is what you can squeeze into your time while you’re there. With incredible 360-degree views over Abu Dhabi, afternoon tea at the Observation Deck in Jumeirah at Etihad Towers is a once-in-a-lifetime experience. You can choose between their standard afternoon tea package for $96 or their bubbly afternoon tea for $135. Something this wonderful tends to get booked up fast so make sure you book ahead. Take in the views at Observation Deck in Jumeirah at Etihad Towers as you indulge in a delicious afternoon tea. Located in Tower 2 on the 74th floor at Observation Deck and served from 2 pm to 6 pm daily. Please Note: The entrance fee is AED 95. A credit voucher of AED 55 is attached to the entrance fee and can be redeemed on the day of your visit. Feeling tired after that flight? Wake yourself up with a visit to Yas Waterworld, one of the most thrilling waterparks in the world. If you’re travelling with kids, it will keep them happy all day (and distract them – and you – from the jetlag). There is a free shuttle bus that runs from a number of key pick-up points throughout Dubai (50 minute drive) and Abu Dhabi (25 minute drive) to Yas Island. Online prices start from $96 for a single ticket and $287.60 for a family of four. You can purchase tickets and find more information on shuttle bus times on the Yas Waterworld website. Located on Yas Island in Abu Dhabi and open from 10 am to 7 pm daily. 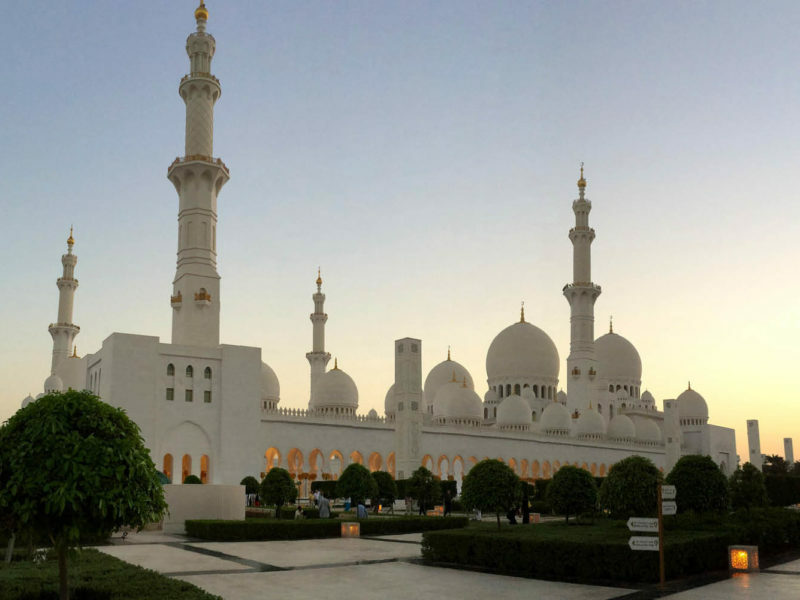 Visiting Abu Dhabi’s Sheikh Zayed Grand mosque is a true cultural privilege. Resembling an Arabian Peninsula Taj Mahal, it took more than 100,000 tonnes of pure white marble to build, and has space for 40,000 worshippers. Free guided cultural tours are available to book through their website and run for 45 minutes. You are required to wear appropriate dress (examples of which can be found here) and note that food and drink – including water – is not allowed to be consumed inside the mosque. 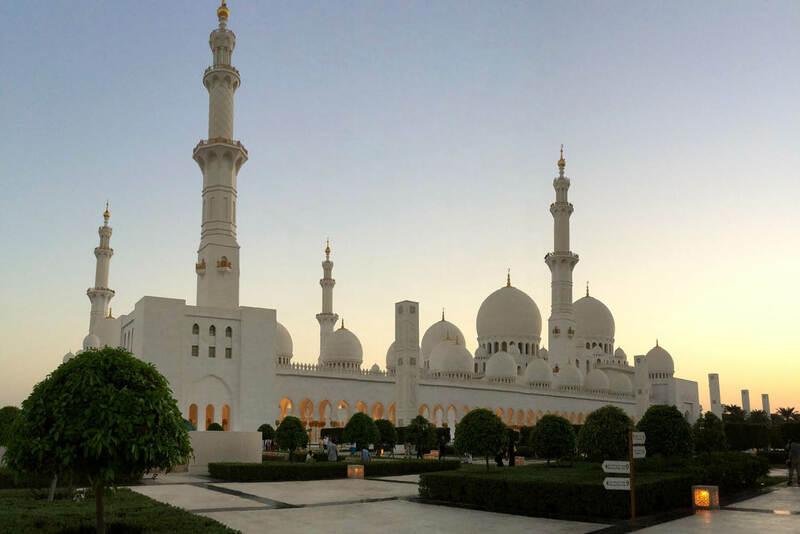 Sheikh Zayed Grand Mosque is 100,000 tonnes of magnificent pure white marble. Address: Sheikh Rashid Bin Saeed St, Abu Dhabi, United Arab Emirates. The mosque is open to visitors from 9 am to 10 pm daily, except on Fridays when it closes to visitors for Friday prayers and reopens at 4:30 pm. The spectacular desert around Abu Dhabi is a must when you are visiting this part of the world. Sure, you can do a camel ride if that’s your bag, but why not take things to the extreme and hop on a board instead? With Nuzhath Ideas and Abu Dhabi Desert Safari you can do just that – guides will take you out to the dunes and teach you all the tricks. Just make sure you wear sunscreen – it gets hot out there. Ski the sand dunes in Abu Dhabi. Maybe you’re after something altogether more chill after that long flight? Look no further than Saadiyat Beach Golf Club, where you play the classic Scottish sport right by the sea, with the breeze on your back. It was the first golf course on the Gulf and was designed by famed South African golfer Gary Player – so it’s pretty much golf heaven. Tee up a game of golf Saadiyat Beach Golf Club. Opened on 11 November 2017 and designed by architect Jean Nouvel, the Louvre Abu Dhabi, costing $650 million to build, needs to be on your list of places to see. Some of the world’s finest works are housed here from the likes of Da Vinci and Van Gogh, all housed under an incredible dome comprised of thousand of stars layered on top of each other to let sunlight filter through to the galleries below. The Lourve is closed on Mondays and open 10 am to 8 pm Saturday to Wednesday (excluding Mondays), and 10 am to 10 pm Thursdays and Fridays. Admission fee of $24.15 for adults, $12.10 for concession and free for children under 13 years. Ever wanted to feel what it’s like riding a Formula One car? At Ferrari World Abu Dhabi, you don’t have to imagine, because its Formula Rossa ride has been made to match the speeds set on the track – 240 kilometres an hour in 4.9 seconds, to be exact. Designed so you feel like you’re in a Ferrari F1 car too, you will take to the skies feeling legendary – and get back to earth feeling even better. Get the adrenaline pumping at Ferrari World. Online prices start from $114 for a general admission. You can purchase tickets and find more information on the free shuttle bus service on the Ferrari World Abu Dhabi website. Located on Yas Island in Abu Dhabi, open every day from 11 am to 8 pm. A hotel is a hotel is a hotel, right? Wrong. Designed by Hani Rashid and Lise Anne Couture, the Yas Hotel is built over the F1 Yas Marina Circuit, and looks like something from outer space, it’s that futuristic. Without a doubt – a night here is set to be one of the most luxurious, most fabulous nights of your life. Stay a night in an icon at the Yas Hotel. Located on Yas Island, you’ll be in prime position to access Yas Waterworld and Ferrari World. Prices start from around $210 per night. Want to spend longer in Abu Dhabi? Visit our Abu Dhabi guide for more travel tips and inspiration.